1920's New York City. Jazz and gin mix with murder and mystery. For Evie O'Neill - fresh in from Ohio to the city of her dreams after her demonstration of a strange power caused a scandal in society - this is what she's always dreamed of. But dreams can become nightmares, and when Evie, her uncle Will and their friends find themselves trying to stop a serial killer, she'll have to use all of her wits, as well as her power, to stay alive. 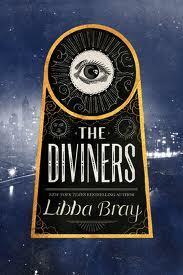 As you'd expect from Libba Bray, there are some really strong points to this supernatural historical novel. Evie is a vivacious main character, her Uncle Will, curator of the Museum of Creepy Crawlies, is a solid foil to her, and there's love interests provided in the mysterious Sam and her uncle's employee Jericho, both of whom seem to have secrets of their own. I loved the dialogue - Evie herself would no doubt describe it as 'pos-i-tute-ly' wonderful. I also thought that the book was very well plotted and it's great to see the first novel in a new series end so strongly - with a definite resolution to the main story followed by lots of intriguing teases to set up the sequel. That said, I didn't love this as much as I was expecting to, and I think the main issue is that it's so long. I'm far from being averse to huge reads - Department 19: The Rising by Will Hill and The Monstrumologist: The Isle of Blood by Rick Yancey both run to over 550 pages but are two of my favourites this year. In both of those cases, though, they're tightly focused on the main story despite their epic length, while in this one there are so many sub-plots and characters to follow that it was difficult to feel really drawn in until the superb last third of the book. Overall, I wouldn't say this was as spellbinding as Bray's Gemma Doyle trilogy, but it's still one which supernatural or historical fans should really enjoy. The satisfying ending is a particularly strong point but I'm also intrigued as to where the series will go from here, and will definitely be eagerly waiting for book 2! I agree about it being a tad too long. Or rather, what Bray did with the length. Yes, a few too many sub-plots and characters. Although, some of those sub-plots were more interesting for me than the main plot. But I thought it was a stylish novel and am interested to see which plot line is picked up most in the next one. Can A Spoiler Destroy A Story?